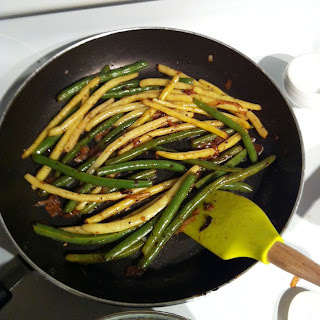 You start with blanching the green beans by cooking them in salted boiling water for 5 minutes and then an ice water bath. While that is happening heat up your butter on medium heat and add the crushed garlic allowing it to slightly brown. Turn off heat and have it sit for 10 minutes to get all that garlicky flavor*. Discard garlic. *Quick note I have also just minced the garlic and added it to the butter and slightly brown leaving it in to save on time. As you can tell writing recipes is not my hidden talent, but I really wanted to share this easy and tasty dish. I loved this so much I may just make it again tonight!